Disney Did Any One Notice This!?! i noticed this when i watched Hercules. just watch the pictures below an you'll knoe what i mean. 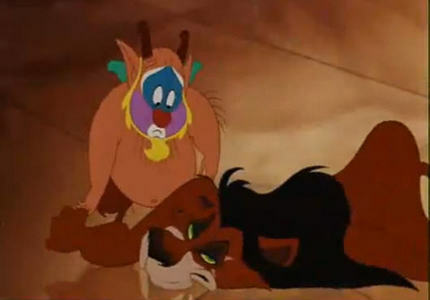 Hercules is wearing simba's uncle's custome. yep. pretty much every disney movie has a disney cameo..
i was obessesed with hercules too! I've also seen another disney movie where other bits from different movies are in them. Aladin. When they are on the carpet ride singing a whole new world (I love that song) they fly into Hercules's place then to Mulan's. I didn' notice it!! That's interesting! !